LASIK surgery is amongst one of the most frequently performed surgeries in the United States, and is the leading procedure that is performed for corrective eye surgery. There are a number of advantages to LASIK surgery over other refractive surgical procedures, with the primary advantage being the relative lack of pain during the procedure, and the rapid recovery that LASIK patients experience. Corrective eye surgery, which is also known as refractive surgery, is used to treat and correct a wide variety of vision concerns. Some of these vision concerns could include astigmatism, farsightedness, and nearsightedness. The goal of the LASIK surgery is to permanently correct the patient’s vision so that corrective lenses and contacts are no longer needed. 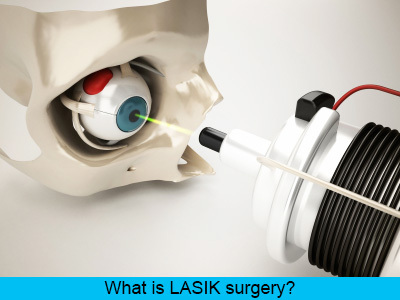 LASIK is short for laser-assisted in situ keratomileusis. While LASIK is considered to be a surgical procedure, it is usually performed in the offices of an ophthalmology surgeon or a surgery center, and it is done as an out-patient procedure. The procedure itself only takes about 20 minutes, however in general patients can expect to spend around 2 hours in the office for pre-testing and post-op testing. While the processes and techniques may differ slightly between surgeons, they are essentially performed in the same manner. Prior to the surgery, the LASIK patient will be offered a mild oral sedative that will to ensure that they are relaxed and free from the anxiety that a large number of patients experience in relation to a LASIK procedure. Once the sedative has started to take effective, the patient will still be awake and relatively alert, but will be free from the anxiety that he or she would otherwise be experiencing. The patient is asked to relax in the surgical chair and anesthetizing eye drops are applied directly to the eye. These eye drops are very similar in nature to the topical ointments that your dentist will use to numb your gums prior to the start of a dental procedure. The drops work very quickly and effectively. The LASIK surgeon will then apply a soft suction cup to the eye, which will prevent the eye from rolling or moving during the procedure. This part of the procedure may cause the patient to feel a little bit of pressure but in general it will not cause any pain or discomfort, as a result of the anesthetizing drops doing their work to effectively numb the eye. Once the patient’s eye has been immobilized, the LASIK surgeon will use one of two methods to create a corneal flap that will be folded back, thus allowing the surgeon direct access to the cornea. This process will not be at all painful for the patient, but it may be somewhat uncomfortable due to it being an unfamiliar sensation with a bit of pressure involved. With the hinged flap pulled gently back, the LASIK surgeon will use a laser to gently remodel the cornea in order to achieve the desired results. Many patients report that they feel disorientated during this portion of the procedure, and their vision becomes exceeding blurry. This may cause some movement of the eye; however the laser being used for the procedure makes use of advanced eye-tracking systems that swiftly follow any minor movements of the eye while performing the corrective procedure. After the laser has reshaped the cornea to the specifications of the surgeon, the hinged corneal flap is carefully repositioned over the eye. No sutures are applied to the eye because the eye’s natural moisture will hold it in place until the healing process has been completed. Patients often report seeing an immediate improvement in their vision, and vision will continue to improve as the cornea heals itself over the course of the next several months. The procedures used can vary between surgeons, and can also be impacted by the type of eye issues that the LASIK procedure is remedying. On average the LASIK procedure lasts just a few minutes, and the patient feels absolutely no pain, with only a little discomfort likely as a result to the pressure and unfamiliarity of the procedure. LASIK has a high success rate, particularly if the patients follow the post-operative instructions of their surgeon. Patients are typically prescribed a round of antibiotics that will help to stave off an infection, and eye drops will also be prescribed to help reduce swelling and to reduce the dry eyes typically associated with the LASIK procedure. Protective eyewear should also be worn for at least the first week following the procedure in order to protect the healing cornea from bright sunlight. Some of the post-operative instructions will include the following. Patients should be sure to follow up with their LASIK surgeon and with their regular optometrist in order to effectively monitor the healing of the eyes and to evaluate the overall health of the eyes. And of course if complications or a worsening of the vision occurs, patients are also urged to immediately reach out to their surgeon. The LASIK procedure can be divided into 3 major phases. The first phase involves the creation of the corneal flap with a microkeratome (a very small tool that slices into the cornea). This phase of the procedure requires a temporary but significant increase in the intraocular pressure. The second phase involves photocoagulation with a laser of the stromal bed (the corneal tissue under the flap). The third phase involves the repositioning of the corneal flap. It is during the first 2 phases that the eye is stressed the most. at eyefreedom.